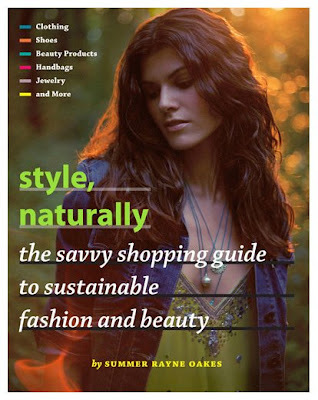 Curate Your Consumption: SUMMER RAYNE OAKES' STYLE, NATURALLY IS OUT! Fact 1: Summer Rayne Oakes (or SRO as she is sometimes called) is truly stylish. Just watch some of her myriad youtube videos...she appears in all garbs, but always looking individual and chic/cool/fashionable/all of the above. This is someone who's views on fashion and style you want to hear. Fact 2: she has modelled quite a bit but her interest in ethical/eco style and fashion isn't shaped primarily by this sort of involvement in the field. Rather she has done some more in-depth study of the environment (she has an entomolgy and environmental science undergrad degree from Cornell). So she understands the science of being eco rather better than if she just looked pretty in 'trendy' green fashion. The latter, while commendable (at least more than just looking pretty in any old, mainstream, not-very -good-for-anyone-at-all, fashion), isn't grounds for buying a whole book by that pretty person. At least not to me. Fact 3: As anyone who knows her knows very well, she has her fingers in most if not all the ethical fashion and design pies around....especially in North America, where so many of the most prominent, promising and solvent eco-labels originated. This is a woman that knows much about the business of ethical style. A she says in the promo video above, it is essential to discuss the 'cost' of being a green fashionista...and she suggests it actually can save you money. To these quite compelling facts I'd add that she has a natural, humorous writing voice and her 'take' on being ethically aware in personal style is not one of judging but rather of showing a genuinely better way. Any book that she has penned is likely to be a fun read. None of this is to say that I haven't had moments of feeling she was a bit OTT with her self-marketing...but then, thats American gusto for you, I guess (Oprah anyone?). And also I guess she is entitled to be as ambitious and the next media-exposed person (Oprah anyone), so perhaps its par for the course. Be that all as it may, it needn't affect our judgement on her ability and place in the eco-fashion/design/style world, to write an informative book. So all that to say I'm off to buy the book on Amazon. The sneak preview shows plenty of interesting ideas from some fabulous designers - we love the fact the Doie features prominently with the collections at DeviDoll. Looking forward to hearing what you thought of the book....and expecting ourselves to find a true blend of fashion and eco cred!